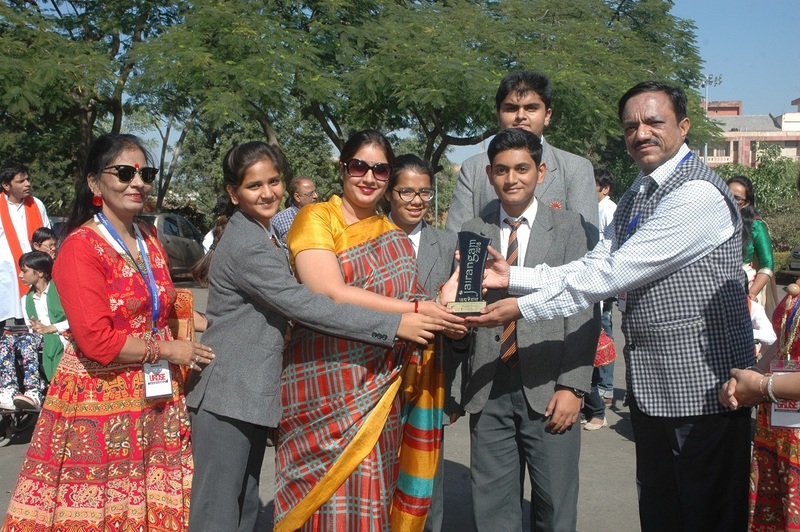 Jaipur, 26 November: The sixth day of the on-going annual theatre festival of Pink City ‘Au-Jairangam, began with the prize distribution for inter school nukkad natakcompetition today at Jawahar Kala Kendra. The first prize was bagged by the students of Maharaja Sawai Bhawani Singh School who presented a nukkad natak based on the theme ‘Sab Chalta Hai’. The second and third position was awarded to Warren Academy School (on theme ‘Awaaaz’) and Vidyasthali Public School (on theme ‘Swacch Bharat, Swasth Bharat’) respectively. On the occasion, special students from Disha School, Umang and Learning Aspirations were also awarded for their outstanding performances in nukkad natak. The awards to the winners were distributed by President 3 M Dot Bands, Mr. Narendra Gour.